Today we are announcing a change in strategy for Backup & Restore for Podio. This change includes a new feature, along with new price plans. After Podio's downtime in january, we have learned that sending incremental CSV files to your cloud or FTP server is not useful enough when Podio is not available. That’s why we want to significantly improve our service by introducing a new feature: a daily sync of your Podio apps to Google Sheets. For each of your Podio apps, we will create a Google Sheet document. These Google Sheet documents will contain all of your items data - similar to an xls export from Podio. For each of your workspaces, we will create a Google Drive folder where we store all your attachments from the related workspace. You will receive a view-only link to the Google Drive folder which allows you to view and download your files. It is not required to have a Google account, and we will pay for the storage used. Comments, tasks, app templates will be stored on our AWS servers and will be used to restore an item via our interface. The Podio backup app will no longer be used. You can find more information about the Google Sheet sync on our updated FAQ page. Important: We will gradually phase out the ability to sync your Podio data to your cloud or FTP server, and replace it with the sync to Google Sheets. 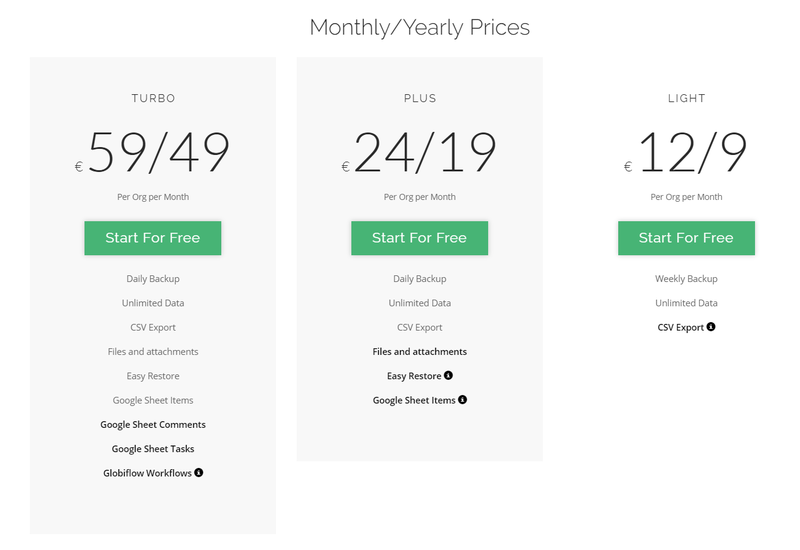 We will keep our 3 price tiers, but with different features and prices. The currency will change from USD to EUR. All existing customers will be able to maintain their original prices for another 6 months. As of the 1st of December, all monthly subscriptions will be moved to the new pricing model/price plans and the billing currency will change from USD to EUR. If you have a Plus or Turbo subscription, you will have the option to activate the Google Sheet sync for your account via our web interface. 1/07/2018: The ability to sync your Podio data to your cloud or FTP server will no longer be supported.